Celebrities are extremely influential in China and, when we heard A-list rock band, Miserable Faith, was coming to the UK, we made sure that our client, Hard Rock Cafe, became part of their journey. The resulting coverage reached 3 million people on Chinese social media platform, Weibo. In Summer 2016, we heard through our contacts in Beijing that Chinese rock group, Miserable Faith, would be visiting the UK on a tour sponsored by Canon and China’s most important travel social media and review site, Mafengwo. When we heard they were coming to London, we knew that we had to invite them to lunch at the original Hard Rock Cafe. So we did. The band and its entourage enjoyed a great meal at Hard Rock Cafe – they were given a VIP tour of The Vault to see the restaurant’s fantastic memorabilia and to have their pictures taken. They were also presented with classic t-shirts bearing their names – a wonderful gift to take home with them. Miserable Faith is one of the most popular rock bands in China. The band formed in 1999, have released six albums, and regularly headline China’s outdoor music festivals. 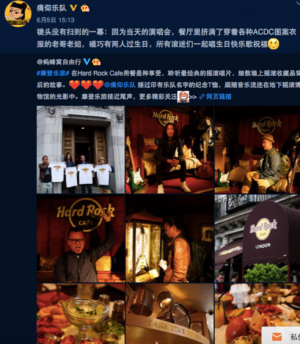 Mafengwo has 2.98 million Weibo followers and, following Miserable Faith’s visit to Hard Rock Cafe, they posted about the visit on the social media platform. Miserable Faith re-posted immediately on their Weibo account to their own 369,000 followers, and added their own content and comments. A celebrity-endorsed post like this on Weibo can cost upwards of £10,000 in China. Due to our connections and relationships in Beijing, we were able to deliver this for our client, Hard Rock Cafe, without charge. 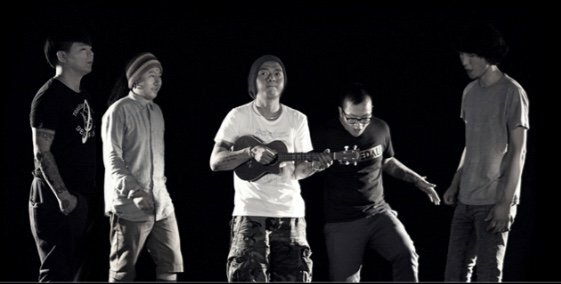 On their return, the band wrote a travelogue hosted with click-through home page banners on mafengwo.com. The travelogue imagery included the Hard Rock Cafe’s iconic guitar, and pictures of their food, the restaurant, the Hard Rock Cafe’s museum, The Vault, and their merchandise. Mafengwo has 35 million visitors a day on its app and website, and a travelogue like this is valued at around £23,000. See the full media coverage here: miserable-faiths-media-clipping. The influence of the Chinese media and KOLs (Key Opinion Leaders) can not be overestimated, and reaching out to them on behalf of our clients is one of our top priorities. In 2016, we hosted a journalist from the upmarket Chinese magazine, Travel +, at the Hard Rock Cafe in New Orleans, an influential Chinese travel blogger for lunch in Phoenix City, and a TV crew at the Hard Rock Cafe in Saipan.